For most homeowners, the goal of renovating is to transform an existing space into an idealized domicile. Few couples, however, include both the architect whose training can precipitate a vision and the professional critic whose career is staked on evaluating the work of architects. No pressure! 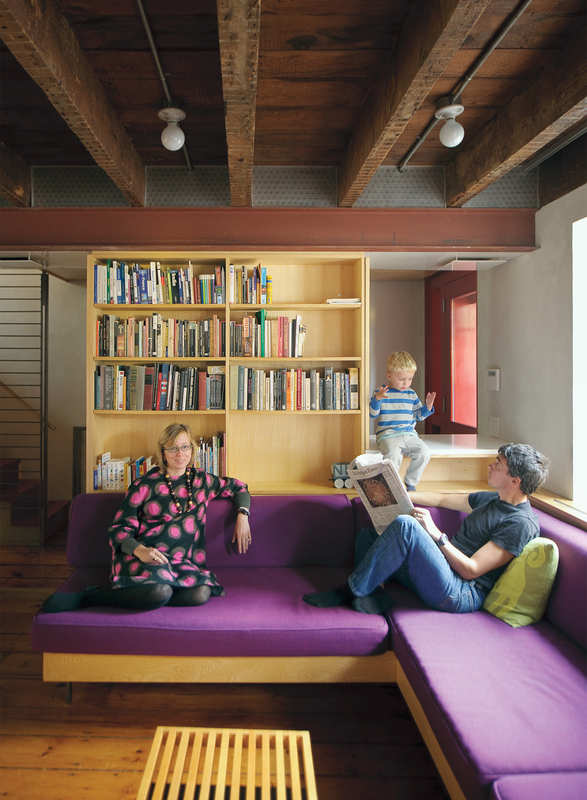 The exposed ceiling beams and inserted steel framing system are visible in the lower level, where Lange and Dixon relax with their son Paul. From the street, Lange and Dixon’s renovated row house is notable for double-hung windows restored to their 19th-century height. Facing the front facade on the English basement level, a sectional of Dixon’s design punctuates the otherwise neutral hues with a stately purple. The lamp is a double-suspension Tolomeo from Artemide. The reupholstered Thonet chair lends balance to the room through its own asymmetry. Brightened by light from the backyard, the built-in credenzas and kitchen cabinetry are by JKK Woodcraft. A Kartell FL/Y pendant lamp bridges the glass and wood details. Lange’s collection of vintage Heath cups and saucers, Jasper Morrison White Moon dinnerware for Rosenthal, and Simon Pearce handblown goblets fill the overhead kitchen cabinets, which are accessible from either side of the counter. The yellow backsplash is back-painted glass. Lange reads the newspaper in a vintage Pierre Paulin Little Tulip chair for Artifort. On the parlor level, the pigmented plaster walls eschew the finish of paint. A modest reveal between the ceiling plane and the walls ingeniously accommodates a concealed picture rail that runs the perimeter of the room. The 1968 painting above the sofa is by op-artist Julian Stanczak. The exposed steel beams delineate access areas from the rooms. The staircase system and fireplaces were fabricated by Wesley Martel. Artwork hangs above the built-in storage in the English basement. Lange’s predilection for vintage design punctuates the space. The office level includes a cozy guest room with a mid-century Heywood Wakefield-esque dresser serving as a bedside table. From the previous owners, Lange spied several key pieces of vintage furniture, including two rare George Nelson Thin Edge dressers for Herman Miller. 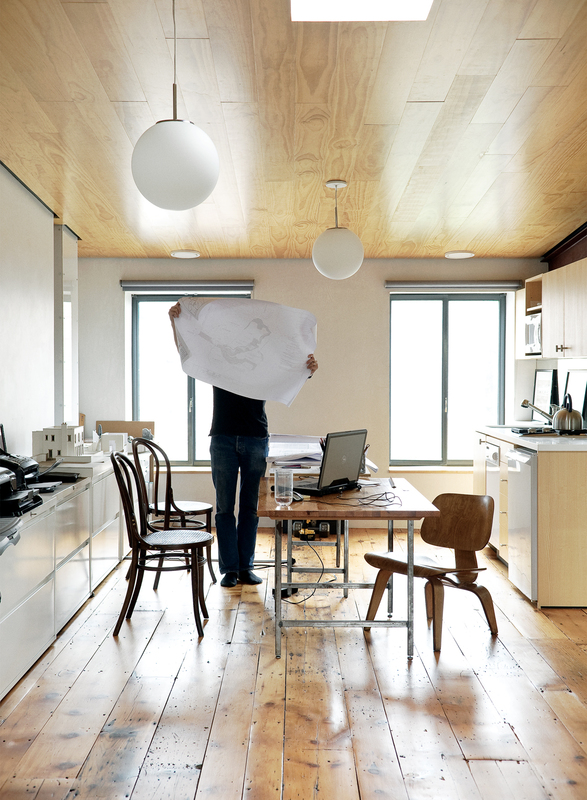 Dixon inspects a drawing in the couple’s shared office on the home’s top floor. The space features a sloping ceiling that rises to ten feet at one end. The new wood of the inserted ceiling counterpoints the vintage pumpkin pine floorboards underfoot. Lange and Dixon opted to use wood for surfaces, such as the ceiling here, where it isn't generally employed. Among Lange's ephemera is a poster designed by her grandfather John Scotford Jr. for Dartmouth's skiway. Another copy is available here: internationalposter.com. By the door, shoes get organized on a built-in by JKK Woodcraft. A fridge clad in cork provides a decidedly warm touch to the kitchen. An icy-blue Kartell FL/Y pendant light adds a distinctly contemporary touch to the rustic English basement level. Family pictures and a letterpress poster by Lange's mother, designer Martha Scotford, adorn a textile covered panel. On the top level of the brownstone, where the couple raised the ceiling to ten feet, architect Mark Dixon takes a ladder up to the roof. A quartet of Jasper Morrison Air Chairs for Magis provide outdoor seating. Paul finds a hiding place amongst the bedroom built-ins. A small Eames Wire-base table provides the perfect dining space for son, Paul. Paul spreads out his toys on a rug from Pottery Barn. The 1968 painting above the sofa is by op-artist Julian Stanczak. The concealed picture rail from which it hangs runs the perimeter of the room. The exposed steel framing system is visible on the parlor floor, where Dixon and Paul share a laugh. On the parlor level, the distinctive pigmented plaster walls eschews the finish of paint. Paul Rudolph, Eero Saarinen, Corbu, and Paul Rand account for a dose of the couple's reading material. Green Heath tile, with their signature unevenness, provide a warm touch to the modern space. A cut-out in the glass allows the bather to dial in the right temperature on the Kohler fixture before stepping into the shower. The exposed ceiling beams and inserted steel framing system are visible in the lower level, where Lange and Dixon relax with their son Paul. Image courtesy of matthew williams. For Mark Dixon, an architect, and Alexandra Lange, an architecture critic (and sometime Dwell contributor) and coauthor of the new book Design Research: The Store That Brought Modern Living to American Homes, reuniting the separate levels of a typical mid-19th-century duplexed house common to the Cobble Hill neighborhood of Brooklyn would challenge their expertise and expectations. Their collaboration provided clues as to how their design ideas—his as a designer, hers as a passionate observer—would translate into practice. Facing the front facade on the English basement level, a sectional of Dixon’s design punctuates the otherwise neutral hues with a stately purple. The lamp is a double-suspension Tolomeo from Artemide. The reupholstered Thonet chair lends balance to the room through its own asymmetry. Image courtesy of matthew williams. These inspirations led Dixon to a process of subtraction and insertion. Common to rowhouses of the era, the partially below grade English basement level was murky. An interior wall divided the space awkwardly and was among the first things to go. In its place an open frame of exposed steel beams now projects up through all four levels, adding structural strength with minimal structure. The process of peeling back to essentials extended to the exposed subfloor, which revealed a patinated wood popularly known as pumpkin pine. The front windows, the bottoms of which had been bricked over, were restored to their original to-the-floor height, dramatically increasing the daylight quotient (and reinstating the facade’s original character). Brightened by light from the backyard, the built-in credenzas and kitchen cabinetry are by JKK Woodcraft. A Kartell FL/Y pendant lamp bridges the glass and wood details. Image courtesy of matthew williams. But authentically restoring everything, such as the dark brick walls, was not part of the plan. “We wanted a light-colored material, but not a paint finish—something more like mortar,” says Dixon. 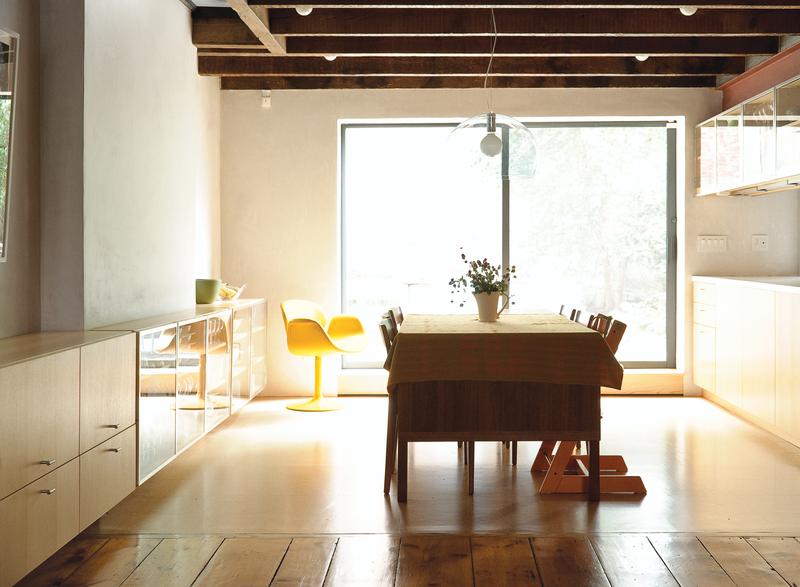 “We arrived at pigmented plaster—it’s in the same industrial world as brick. The walls are uniformly light gray but slightly mottled.” The effect hearkens to the claylike color of concrete favored by Kahn, but without the brutal texture, and creates a perceptibly sedate atmosphere throughout the house. The next step in structural unification came with new staircases. A solid wooden flight, coated with so many layers of red paint so as to approach heavy lacquer, connects the downstairs family area to the parlor floor—an expansive living room defined by ash bookcases set between the steel frame uprights. The remaining flights are fabricated from folded steel with parallel side struts, a design that negates the hefty square tube backbone that supports most metal stairs. The effect is structurally detailed yet light, an exercise in precision by fabricator Wesley Martel, who also removed the heavy hearths of the fireplaces in favor of fine flat fronts. Dixon’s curiosity about inserting volumes within larger spaces involved approaching the bedrooms and bathrooms essentially as cabinetry. “I was interested in cabinetry wall ideas while working on renovations of similar buildings before we purchased the house.” Like the bookcases in the living room, the built-out walls are framed in ash, constructed more as volumes than slabs. They hide pocket doors in the nursery and guest room and create refined counterpoints to the plaster. The insertion concept extends to an electric and HVAC utility core masked by white acrylic, which, in combination with the exposed steel beams, could seem aggressively industrial but instead nestles along the bookcases almost imperceptibly. The couple’s combined design ideas find maximum expression in their shared office on the top floor, where the ceiling now crests at one end to an uplifting 10 feet. “It was the serene feeling of being up in the light and the treetops that made us both want the top floor to be the office, but the original ceiling was seven feet high front to back and the whole floor felt like a garret,” says Dixon. Their work areas correspond to their individual personalities and approaches—Lange at an antique desk with just a computer, paper planner, and a notebook, Dixon at a workstation with synthetic stone samples, a large plotter, and other necessary accoutrements of the working architect. Dixon inspects a drawing in the couple’s shared office on the home’s top floor. The space features a sloping ceiling that rises to ten feet at one end. The new wood of the inserted ceiling counterpoints the vintage pumpkin pine floorboards underfoot. Image courtesy of matthew williams. On the parlor level, the pigmented plaster walls eschew the finish of paint. A modest reveal between the ceiling plane and the walls ingeniously accommodates a concealed picture rail that runs the perimeter of the room. The 1968 painting above the sofa is by op-artist Julian Stanczak. Image courtesy of matthew williams. It’s with a tinge of embarrassment that Lange and Dixon now recount the difficulties they encountered and overcame during the remodel. There’s also a sense that the process itself, however challenging to their skills, instincts, and relationship, provided indispensable professional lessons. As they continue on their respective paths of architect and critic, Dixon and Lange can add an important experience to their credentials: client. Click through the extended slideshow to see more photos from the project.